The Black Russian Terrier is a very calm, sure, and courageous breed. It is a great companion because they tend to be incredibly loyal and protective to its family. When approached by a stranger, the Black Russian Terrier can be very reserved as a sort of protection. When it comes to being trained, this dog breed is very able because they are very quick learners. They are, however, independent thinkers and can occasionally be stubborn if it is pushed to do something that it does not agree with doing. 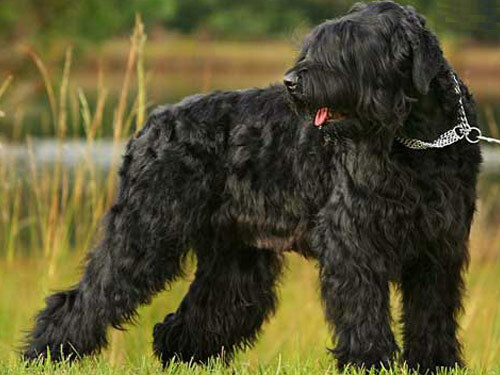 As a companion, the Black Russian Terrier is very affectionate and loves to be close to its family. They are very gentle and play well with children, so they are very well suited for a home with kids. They may be strange or stubborn with dominant dogs, but tend to get along just fine with dogs that are smaller than they other, as well as other household animals. Obedience is something that the Black Russian Terriers are good at because it allows then to channel their mental energy. They do require physical and mental stimulation on a daily basis. The mental stimulation can be achieved by training sessions, or outdoor play sessions. Physical exercise requirements can be achieved by jogging, long walks, or long hikes on a leash. Its coat does require some maintenance and needs to be brushed quite frequently. It also needs to be trimmed every 6 weeks. The coat is typically dark and can stay very shiny and healthy is maintained appropriately. Chronic Hip Dysplasia, also known as CHD in the medical field, is a health concerns that tends to affect this breed. Elbow Dysplasia is also seen pretty frequently. PRA and dwarfism are occasionally seen in the breed. It is suggested that if you own a Black Russian Terrier, you should test your dogs for hip, elbow, and eye issues on a yearly basis at your local vet office. During the 1940s, the Soviets needed to find capable working dogs for their military. To do this, they imported breeds from all over, but mainly their occupied countries which were German breeds. The favored import was the Giant Schnauzer and it was bred with females from many different breeds. The most favored out of all these breeds that the Giant Schnauzer bred with was the Airedale Terrier, Rotweilier, and Moscow Water Dog. They all had dark black coats and were considered the “Black Terrier” group. They were then bred within their group and by 1957, there were second and third generation dogs that were presented. The main concerns when being bred were their working ability and their versatility. Besides sharing guard duties with soldiers, military tasks also included detecting mines and explosive materials, transporting supplies, pulling sledges, and finding wounded soldiers. All of these tasks were done in the harshest of climates so the breed was very resilient. Some of the harsh places where these dogs worked and survived was Afghanistan and Bosnia. Bosnia has one of the harshest climates.